I was really impressed that this mascara didn’t clump. It makes my eyelashes stand out. Also, I like the fact that it stays on all day without fading. The mascara is a smooth paste, it’s not clumpy and not too fluid. It is sheer black in colour. It goes on well, the only problem I’ve had is accidentally getting the mascara in my eye – good thing that it does not harm the eye or burn. It dries fast, does not smear easily and it washes off easy. One of my favourite things about this mascara is that it doesn’t flake off or smear during the day. This was one of my favourite mascaras for a while, because I felt that it added so much volume to your eyelashes, while also curling them. It separates the lashes really nicely and makes them look more thick and full. The packaging: I’m not crazy about the packaging, only because I find it incredibly bulky. It takes up quite a lot of space and rolls around a lot due to its shape. The wand: The mascara wand is the right length and the bristles work nicely with my eyelashes. I got this product from my local sales rep. 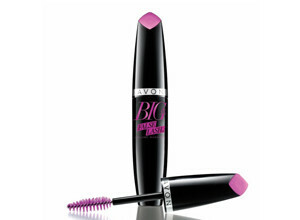 I saw it in the brochure, and the name was catchy; ‘big and false lash’ got me, and I had to get it. I was really impressed with the packaging, it’s so cute in black and pink. But when i tried it on, I was not impressed because I had to apply almost 5 coats of mascara to actually see results. I’m so disappointed that this product doesn’t live up to its name. This productive is affordable, everlasting and easy to apply. I love how it just makes my eyes pop. I like how much dimension it gives. I always love trying Avon’s new Mascaras this one is especially nice if you’re wearing it on your natural lashes; it really does give them that extra fullness and dimension!!! I personally like to use it with my False lashes as it has a nice Big brush.